Russia's new-generation spacecraft replacing Soyuz would be equipped with a lighter, wider and a more durable docking mechanism. 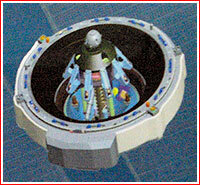 Unlike the Soyuz, where the docking port is discarded and burns up in the atmosphere along with the habitation module of the spacecraft at the end of each mission, the new-generation PTK spacecraft will carry its docking mechanism on the descent vehicle, VA, which was designed for at least 10 flights. As a result, the new version of the veteran drogue-and-cone mechanism would have to be certified to endure the reentry into the Earth's atmosphere with a second cosmic velocity (11.2 kilometers per second) upon the return from lunar missions with the rest of PTK's descent vehicle. In August 2015, RKK Energia, the prime contractor in the PTK project, released specifications for a new docking port intended for the PTK NP spacecraft, which would enable the linkup of vehicles as heavy as 30 tons and equipped with any available rendezvous system. The new design promised to reduce loads during docking by as much as 30 percent. The new port also provided a wider transfer tunnel for the crew, which was previously available only on large space station modules. 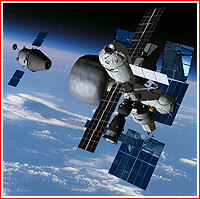 During its early missions in 2023 and 2024, the PTK spacecraft would use the docking port to link up with the Russian segment of the International Space Station, ISS, or with the follow-on space station. 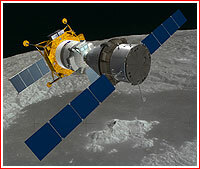 Under the current circumlunar mission scenario, the PTK spacecraft would also dock with an unmanned space tug in the Earth's orbit, which would then boost the spacecraft toward the Moon. 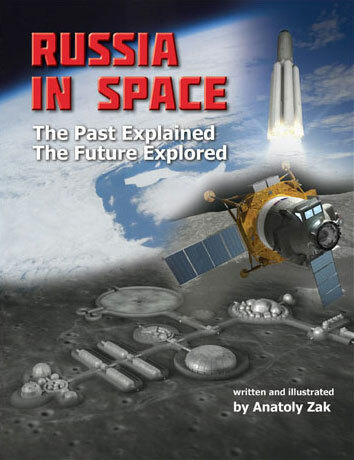 As of 2015, the unmanned circumlunar mission was planned for as early as 2024, paving the way to a flight of the crew around 2025. During the following expeditions to the Moon, the PTK NP spacecraft would first dock with the space tug in the Earth's orbit and then use the same port to link up with the lunar lander. Following the return of the lander from the surface of the Moon, PTK would make its third docking of the mission to provide transfer of the crew from the lunar module back into the PTK NP. With three docking operations during each of 10 missions, each mechanism could be in action in space for as many as 30 times. In 2018, RKK Energia also redesigned the top structure of the Command Compartment, KO, a part of the Return Vehicle, to make possible the ship's visits to the international gateway in the lunar orbit in addition to trips to the Earth's orbiting space station.